HABA 2387 - Watch out, the zippy scooters are coming speeding round the corner. Who is as fast as the cars and can be the first to place their tiles? 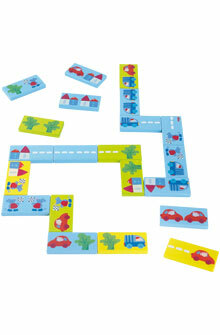 A funny car placing game for 2-4 children. Includes variation for a solo player. Contains 21 handy wooden pieces. Tile measures 2.7" x 1.4".